A Special trail from the Pyrenees to the Mediterranean Sea with daily opportunities to swim in fresh water lakes, rivers and finally in the salt water sea. On one day we can even swim with our horses. We pass through deep stone oak and pine forests on secluded paths, where we find our first pool deep within the Mediterranean forest, where a waterfall splashes from high above. The atmosphere reminds us of Costa Rica. On long canters we pass through the valley of the river Fluvia up to the foot hills of the Pyrenees. Here we enter deep into a mixed forest providing shade. At the mountain stream Manol we again discover a huge pool - perfect for swimming! Deeper and deeper we ride into the nature reserve of Garrotxa and then descend to the most beautiful natural pool in the Pre-Pyrenees, with turquoise and crystal clear river water, where we swim and have a picnic! Following high paths with beautiful views of the Mediterranean, we come to a new vegetation zone - chestnut and cork oak forests cover the mountains here. In the middle of the Pyrenees we stay overnight in the pretty wooden houses of Can Roquet. We take a dip in the pool and while we are having our evening meal on the terrace, we have a fantastic panoramic view of the surrounding mountains. The next day our swim will be in a mountain lake and it's a dream comes true - we can go for a swim with the horses! The next day we quickly trot through a soft hilly landscape with its broad forests and meadows. The sweet-smelling pine forest and the soil with a tinge of red remind us of Arizona. In front of us, the plateau of the Alt Emporda opens. The next day we reach the Mediterranean. Our strong Andalusian horses manage the mountains easily and in the afternoon, we descend to the picturesque fisherman's bay. We have reached salt water and can have a swim in the sea! On the terrace of the hotel we conclude the wonderful trail with good wine and a delicious meal. 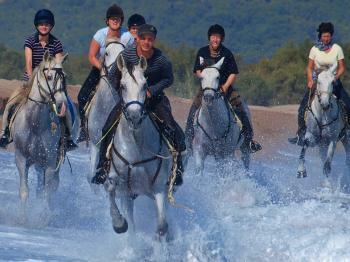 - Trail riding in Catalonia from mountains to sea! Rates do not include: Airport transfers, entrance fees to museums and monuments, 2 lunches or dinners at restaurant (board fee €60, payable by cash at first dinner), drinks and food in bars, alcoholic beverages and soft drinks, coffee at dinner, gratuities. Arrival in Barcelona or Girona and transfer to Hostal Nou, a beautiful country hotel. Depending on the season you may stay at an alternative guesthouse of a similar standard nearby. A delicious evening meal around 9:00pm and overnight stay with views of the surroundings. The unique light transforms the surroundings into a picturesque painting! Our way takes us through the wide valley of the river Fluvia with a magnificent view of the surrounding mountains of Catalonia. In the afternoon, we reach a nice schoolhouse, a small paradise at the foot of the Catalan Pyrenees. Who wants to jump into the swimming pool? Along the Catalan Pyrenean coast, we dive deep into a shady mixed forest. In a lonely valley, a small mountain stream splatters peacefully. We have a bathe! - A jump into the luminous water pool refreshes us and after the from the Mediterranean sun heated rocks warm us up. We have a delicious saddle bag picnic near to the wild river! Our Spanish horses climb hard and confidently over a pass with a magnificent panorama view on the high peaks of the Pyrenees. We stay near a pretty mountain village on the edge of the river Muga. You will be impressed by David's culinary art! We ride deeper and deeper into the Natural Park of Garrotxa. Impressively, huge limestone rocks rise before us. We descend to the most beautiful natural water basins of the pre-Pyrenees. We have a bathe in the turquoise and crystal-clear shiny river and afterwards we enjoy another delicious lunch. On the mountain path with a great view of the Mediterranean we reach a new vegetation zone. Chestnut and cork oak forests cover the mountains here. We return to Sant Llorenç de la Muga where David is waiting for us with a delicious dinner. On the terrace, we enjoy a magnificent panorama view of the surrounding mountains. Today we want to bathe in the lake. We pass through a cork oak forest which gives out a silver, shimmering light. The sandy ground invites us to lively canters and soon we have reached our bathing place. It's a dream comes true - we can go for a swim with the horses! After a picnic and a “siesta”, we quickly trot and canter through the vast plain of the Empordà. Our accommodation for the night is a family run guesthouse situated at a cosy medieval village. Today we get up early and we ride to the sea! Ancient olive trees and vineyards determine the landscape at sunrise. We approach the coastal mountains of Rodas. The most impressive is the light in this wild and fascinating landscape. We look at the proud formations of the Pyrenean peaks and the Mediterranean in its deep blue. Our Andalusians master the mountain path confidently. We ride down into a picturesque bay of the "Wild Coast". We arrived our destination, we are at the sea! We bathe in the salt water and taste the salt on the skin! On the terrace of our hotel we end this wonderful trail with good wine and a tasty fish dish. Note: This itinerary is a general guideline and in order to offer our customers the best riding holiday experience we often makes changes. Depending on the season, the weather and national holidays, we may make alterations to itineraries at short-notice. Trails can be ridden in both directions. We endeavour to ensure that our high standards of quality are maintained and reflected in the alternatives we choose. Pace: Moderate with extended trots and nice canters. 5-7 hours in the saddle per day. The Ride and Swim in Catalonia trail is a good mix of riding and bathing! Along the rivers you will ride through the Mediterranean Pre-Pyrenees to the Mediterranean Sea. The trail includes mountainous and flat terrain in the valleys and plains. For this reason, the riding pace is very mixed. Lively canters and interesting climbing with the horses gives this trail ride a sporty character for active riders. On two of the days the horses have to be led by us. Comfortable walking shoes are very helpful for approximately 30-minute descents. Over five days, you will spend between 5-7 hours in the saddle and on one day we ride for 4 hours. This is a progressive ride, so nights will be spent in different locations. You will be staying in 5 different locations total. You will experience a special feeling of Catalonia in our accommodations, which offer you a cozy ambience in carefully chosen country guest houses, pensions, and friendly family-run hotels. Far away from mass tourism you will be spoiled by attentive hosts with local specialties. The rooms, mostly with private bath, are charmingly furnished and you almost feel at home. 1-3 nights' accommodation may be with a shared shower and toilet. WIFI is available at some accommodations. Laundry is not available for this trip. Most meals are included in the tour (arrival day dinner and departure day breakfast, 3 days fullboard including wine, 2 days halfboard with wine). Two lunches or dinners are not included in the base pricing since we will be eating at local restaurants. This fee needs to be paid locally at your first dinner. Please note we only accept Euros!